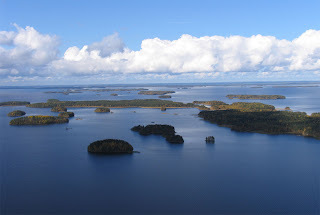 After a day-off which we used for discovery of Helsinki downtown we decided to make a short trip more to the north-east to visit the “land of lakes”. 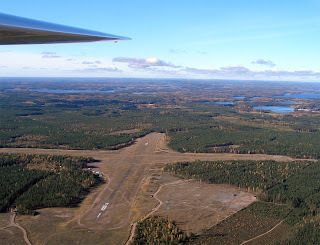 I had no particular preferences where to fly but Tuomas suggested me that Selänpää airfield could be a good destination. And it really was! We took from EFHF and due to the vicinity of Helsinki Vantaa airport we were maintaining altitude of 1000 feet until we exited the Malmi CTR at DAGER point. Later on we climbed a little bit but stayed pretty low to have better view and not to enter the controlled airspace above us. The flight was quite bumpy due to relatively strong wind from south-south-west. We approached Selänpää (EFSE) and nobody was answering on their frequency. We saw two guys who were hardening the terrain around the runways for the forthcoming season. We landed in quite strong crosswind of about 15 knots on only 12 meter wide asphalt runway 30. After parking on the apron we met Mr. Juha Ritari, a very pleasant man, who proposed us a sightseeing tour with his car to the nearby lake which was beyond the normal walking distance. Juha Ritari was really the greatest surprise for us. His hospitality was so great that after having a cup of coffee in a small restaurant he drove us around more then an hour for a sightseeing tour around the Selänpää airfield. Finally we were able to admire the “land of lakes” and see the original Finish farm houses. We also visited the old paper mill in Verla which was restored under UNESO guidance (http://www.verla.fi/). After our return to EFSE airfield, which was built during Second World War and was used by Germans, we visited the club premises and filed the flight plan for flight back to Malmi. Juha wanted to seat in the cockpit of my Piper and I caught him right at that moment. We made some photos and took off from runway 30 back to Helsinki. 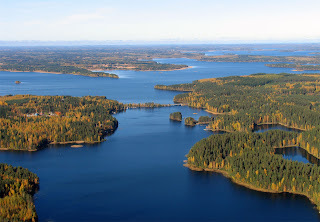 Juha later on sent me some beautiful pictures of the lakes in the Selänpää’s surrounding area. With his kind permission I am publishing them here. I am quite convinced that there is no need to comment the beauty of the nature of this wonderful place. Another great airfield where one should make a mandatory stop and, if possible, join them in their gliding activities and enjoy their hospitality.